Every year for the past 38 Years the National Reye’s Syndrome Foundation has provided life-saving Reye’s Syndrome information to the families of students in more than 136,000 schools across the United States and its Territories. School Nurses and Administrators send a Reye’s Syndrome packet of information home with each student at the beginning of every school year. This packet includes Reye’s Syndrome Symptoms literature, bookmarks with NRSF contact information, wallet size ‘ingredients to avoid’ cards for Over-The-Counter children’s medications, a Reye’s Syndrome brochure, and a list of medicines that contain aspirin. 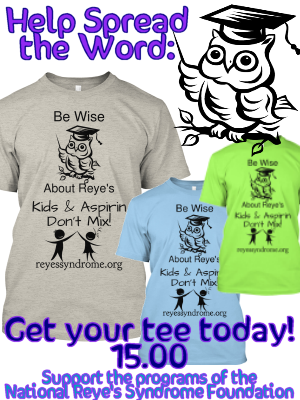 We know that this huge, educational initiative saves the lives of children all across the U.S. and we thank all school administrators and nurses for promoting Reye’s Syndrome Awareness! With the guidance of volunteer leaders from across the United States on our Board, our RS survivors, and our caring community volunteers, the National Reye’s Syndrome Foundation has stayed on mission for 38 years, educating and promoting awareness and saving lives. We truly cherish your investment of time and money, and we count on your trust in our mission to eradicate the incidence of Reye’s Syndrome. The work we do at the NRSF is built on a solid foundation of financial accountability, transparency, and ethics. And there is one more critically important element to our continued success. You. You are here to show us that there is a community of people who keep the mission of the National Reye’s Syndrome Foundation in their hearts each and every day. A major milestone was achieved this year when talks between the NRSF, the FDA, and Bayer Consumer Health Care resulted in all aspirin manufacturers removing the words “baby aspirin” from all packaging and marketing. For 37 years we fought for this life saving agreement and it finally came to fruition. We know that this change will save many lives and we thank the FDA and the aspirin manufacturers for recognizing and acting upon this most serious issue. This year, we have developed more technology to support our Awareness efforts; Android Apps, and E-books, promoting Reye’s Syndrome Awareness. Our new apps; Aspirin Sense and Sensitivity, and A Guide to Chickenpox are both available in the google play store. Our Reye’s Syndrome website is used by more than 150,000 people across the globe each month. Visits always increase at the beginning of the school year, and during flu season. We are proud, and pleased to provide this quality information. With the help of Transfer Me To DVD, located at www.TransferMeToDvd.com, all films and videos spanning our 38 year history have now been transferred to DVD for additional preservation. We Thank them for donating so much of the work and supplies! 6,500 Emails answered this year. 6,200 Phone Calls answered this year. 136,000 Families Educated this year. 1500 Reye’s Syndrome School Projects this year. Millions of Young Lives Saved! We invite you to join us in our work. We invite you to donate toward our Awareness and Education programs. We invite you to join the NRSF as a Member.